Buying large cuts of meat, up to a side, and cutting them yourself can be a real bargain – not only does it save you money, but it allows you to cut the meat as you prefer to eat it, so you can have thick cut chops, or bone out all your meat before freezing so you never have to cut your meat off the bone at the table, whatever you like best. You’ll need a strong apron, not a thin pretty one, as bones can be sharp enough to cut through flimsy fabrics, a good sharp knife and a steel on which to sharpen it, and a cleaver, which needs to be heavy enough to get through or between large bones. The place to start with home butchery is chicken – for two reasons. The first is that chicken prices are on the rise and so cutting your own chickens for the pot will save you a lot of money, and the second is that chicken is a really conveniently sized bird to learn your butchery skills on. Just to prove to yourself how much you’ll be saving, compare buying eight chicken portions with the cost of a single chicken – you’ll be surprised at how much more, per pound or kilo, you pay for ready portioned chicken. To cut a chicken into eight portions: pull out one wing and cut through the joint – a sharp knife will simply slide through the joint. Repeat on the other side. Turn the chicken breast side up and with one hand, pull the breast upwards while cutting the meat just beneath the breast where it joins the backbone. It will come off as one piece that you then divide in two. The thighs and drumsticks can now be separated by stretching out the joint and taking off the drumstick on one side and then the other, and then pull out on the drumstick and run the knife round the joint from top to bottom to lift it from the carcase. You now have eight portions of chicken, and a carcase that you can boil for stock or soup. To butcher a side of pork, lamb or beef you need to allow yourself four hours to do the work. It’s usually much less than this, but for your first time you want to allow extra time for stopping and thinking about what you’re doing. You also need to make sure you have enough space in your freezer for all your bagged meat joints. It is easiest to start with a side of pork. 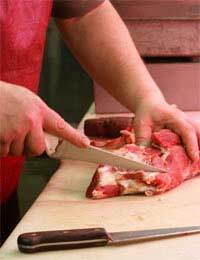 A side is divided into four sections: front (also called shoulder), loin, belly and leg. The front or shoulder of a side of pork will give you: one large shoulder joint and two smaller collar joints plus a shank (all for roasting), a daube, and collar and shoulder steaks for frying or grilling and some pork mince. Moving back along the animal, the loin delivers a loin rack which is very good for dinner parties, a loin joint for roasting, one or two valentine steaks for frying, several boneless loin steaks and some spare ribs. The belly gives belly slices and a couple of belly joints which can be rolled with string and roasted or lined with a green stuffing before rolling and slow cooking. Finally the leg delivers superb tender fillet and T-bone chops, rib chops and sometimes a leg joint that can be rolled and roasted (on small animals this leg joint may be too thin to roll and can be converted to mince), pork bucco and diced pork. It’s essential either to take a class, or to buy a good butchery poster and have it pinned on the wall when butchering a side. It’s a very simple process but it’s easy to forget all the cuts unless you have expert guidance or a good diagram to work from.